This chapter demonstrates about the SVG Browser Support, SVG supported by all the latest browsers, following are the concepts are covered in this chapter. SVG can be supported by all the browsers In order to define the basic support of the SVG user can use the Can I use Resource which provides up to date browser support tables for front end web technologies defines the basic support as the method displaying basic vector graphics features using the embed or object elements. 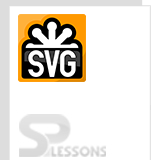 Basic SVG Browser Support is as shown in below image. SVG basic support is supported in all browsers which is not supported only in Internet Explorer 8 and below which means it should be good for production use. Following are versions of IE, which are supported by SVG. Following are versions of Edge, which are supported by SVG. Following are versions of Mozilla Firefox, which are supported by SVG. Following are versions of Google Chrome, which are supported by SVG. Chrome 26 does not support attribute preserveAspectRatio=none. Chrome 48+ no longer has support for the SVGPathSeg intrface. Following are versions of Safari, which are supported by SVG. Following are versions of Opera, which are supported by SVG. Following are versions of iOS Safari, which are supported by SVG. All versions of Opera Mini browser supported by SVG. Following are versions of Android Browser, which are supported by SVG. Android 3 & 4 versions are partially supported. 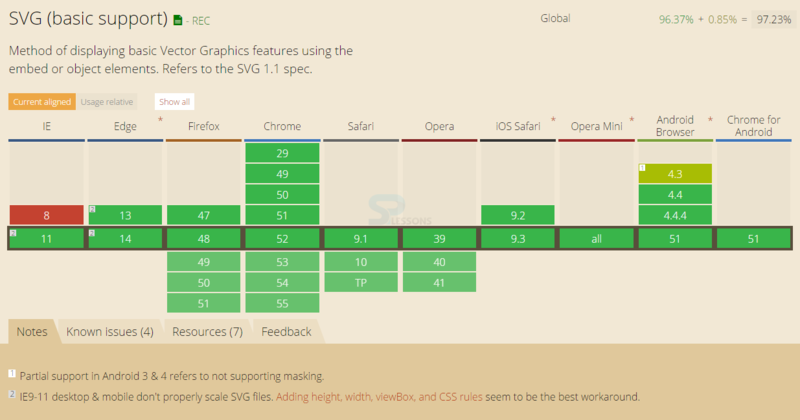 SVG supported by all browsers except IE 8. SVG Good for Production Use.